I have posted pictures from the KL Bird Park before. I actually like to identify the birds before I post them so two more exotic ones got left out initially. 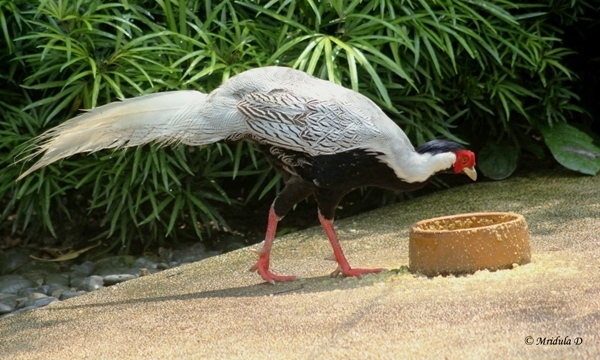 They are the Silver Pheasant and Mandarin Duck. At that point of time I was clicking pictures for making a stop motion video. How I wish I had clicked a better one of the Silver Pheasant! You can check out the official website for the KL Bird Park and explore it before you visit. I took a taxi to the bird park from the Petronas Twin Towers. It took me less than half an hour to reach there. The entry fee was 48 ringgit. This is the adult rate. Children are charged at a lower rate. A ringgit at the moment is roughly 18 Indian rupees. This was my first sighting of a Silver Pheasant and what a magnificent creature it was! All the while that I was in this part of enclosure the bird was going about its business of eating and walking around. But there were quite a few other exotic birds in this part and my attention was divided. There was a pair of Golden Pheasants too but they were hiding in thick bushes and I don’t have a single decent picture of them! 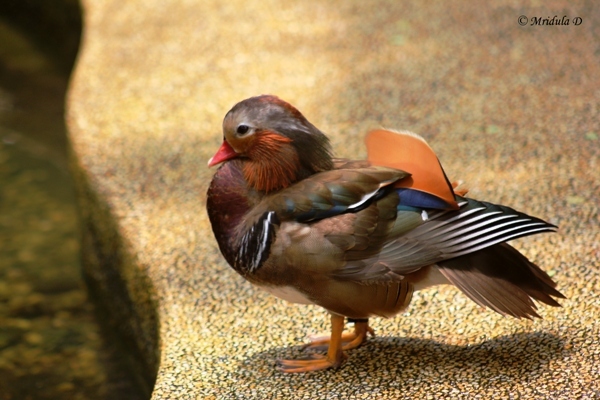 And here is a Mandarin Duck another beauty from the same enclosure. Once again this was the first time I set my eyes on this bird too. The bird park was quite walkable for me but then I love walking. Only I got so enthralled by the first section that I had to rush through the Parakeet section as I had no time, I had a flight back home the same day. It was easy to hire a cab from the park itself and this has been one of my most memorable experiences at KL. So if you love birds, do visit the park.